We started in 2015 with a small event in Cafe En Seine. The audience of sports fans and people involved in the crossover between sport and technology liked what we did so sized up last year attracting attendees from the UK, Europe, Australia and the US, including Mounir Zok, the Head of Innovation with the US Olympic Committee and John Kavanagh, Conor McGregor’s Manager. We are sports fans and we see every day how sport is changing. We decided to invite the world to Dublin to work together on where that change might lead next. Start ups that will change the way sport is played, media companies that are changing the way we see sport and leaders from business in how the growth of sport will keep going. And some very insightful and entertaining keynote speakers that are truly world leaders. We have some global partners on board who are looking for the next breakthrough in sport. The discussions around investment, media and more will present real opportunities for companies looking to turn their dreams into reality within the world of sport. Come with an open mind and a willingness to see beyond what is there at the moment to what the sporting world will be like in two yearsand five years time. Who could have imagines that Champions’ League Finals which cost billions in media rights would now be distributed free on You Tube? Tickets are available now at www.one-zero.com and are moving fast. 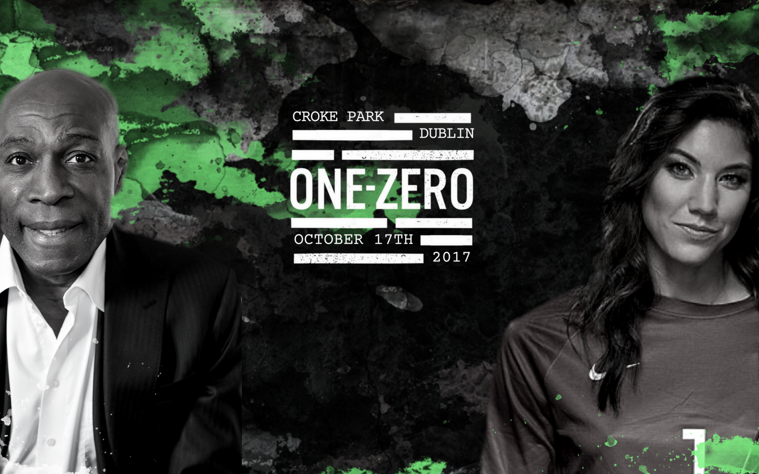 This is an event which was born in Dublin and which is presenting Dublin as a global sports capital at a time of real change across Europe, the UK and the US. There will be a great buzz in the weeks and days running in to it and on the day itself.